If you're sure Aikido is the martial art for you register and pay online today. Member comment: "Lets me be physical in a safe, controlled, but also quite a free way." If you're searching for martial arts classes in Caversham, Reading, White Oak Aikido in Berkshire runs regular classes for beginners at the Caversham Heights Methodist Church Hall on Tuesdays and new students are welcome at any time. To find out if Aikido is the martial art for you, pop along to see us in Caversham to watch any of the Tuesday classes or try a free taster session before you join our eight-week beginners' course. Aikido is a traditional Japanese martial art practised today both for self-defence and for self-development. The many benefits of this fascinating martial art include fitness, flexibility, self-confidence, relaxation and better posture. What's it like training at White Oak Aikido? 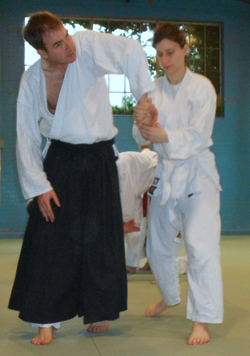 Training is in a non-aggressive, non-competitive atmosphere and White Oak Aikido sessions are led by both a 6th dan male and 4th dan female coach, both qualified to standards required by the Sports Council recognised British Aikido Board, as well as holding the Award in Education and Training. which covers everything you need for your first grading. Watch our Aikido video here! Not what you'll be doing when you start, but sometimes our more senior grades like to show off a bit!